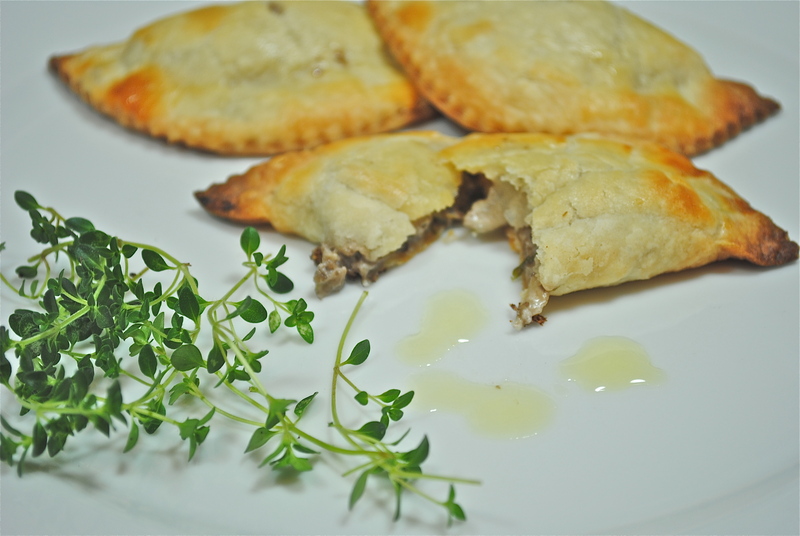 A little drizzle of truffle oil (optional) and you have a delicious appetizer. I don’t know about your grocery, but my grocery store carries so many different kinds of mushrooms it is hard to choose just one variety. There are the white button mushrooms (this recipe), black mushroom, chanterelle, cremini, shiitake, porcini, portobello, clamshell, enok, morel, and oyster. Over the years I have made some wonderful dishes with mushrooms. I make fabulous Pepperoni Stuffed Mushrooms that I actually won a contest with that recipe. My Balsamic Mushroom Panini appetizer is a fancy grilled cheese that is opened up and topped with sauteed mushrooms. A duxelle filling can be put into phyllo cups or can be put under the skin of chicken breast for a beautiful entree. Of course, mushrooms can always be sliced and used on veggie trays and what dish isn’t made better by adding some mushrooms. This recipe takes a little time but you can make the dough up a few days in advance or even make it and freeze it. When you are ready to serve just a brush of beaten egg and they are ready to go into the oven. 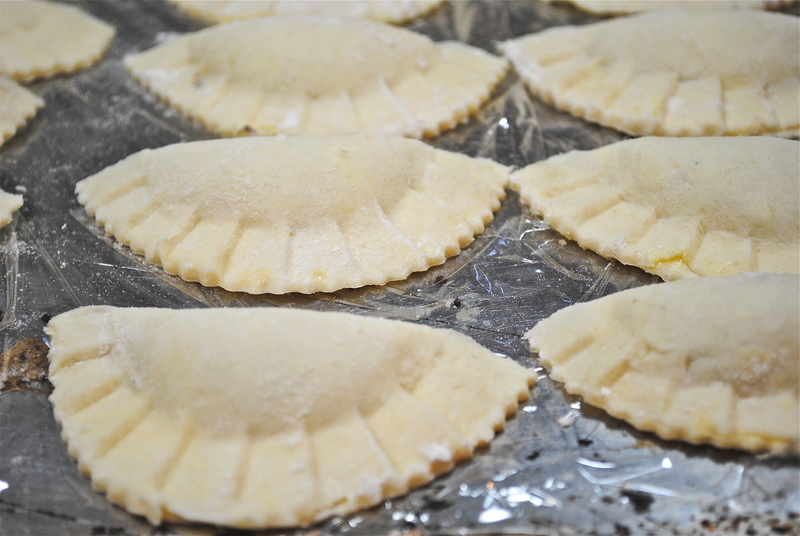 I have a little dumpling mold that works perfect for folding the turnover and crimping the edges, saving you a lot of time and yields a really professional looking turnover. 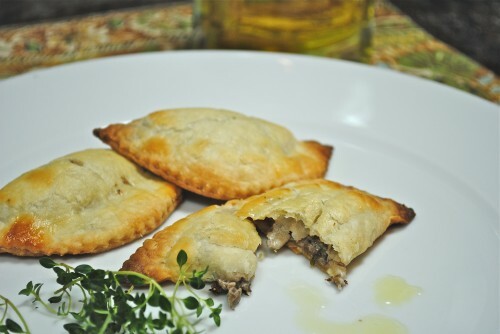 I have made these for years and this is the first time I have drizzled some truffle oil over the baked turnover; wonderful addition. If you don’t have truffle oil, then just enjoy them the way I have for years. The cream cheese pastry is easy to make in the food processor. Process until it balls up. Mushrooms and onions get a whirl in the processor. Mushrooms, onions, and all ingredients cooked and ready for the pastry. I use a dumpling press for a perfectly formed turnover. 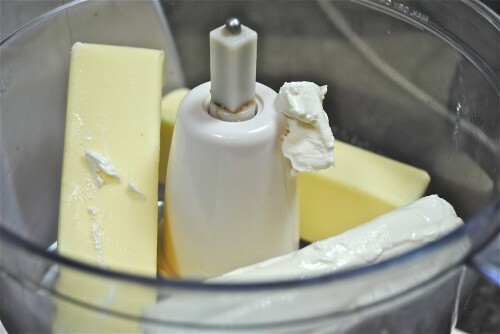 For the crust: In a medium bowl of your food processor mix together the cream cheese and 1 cup of butter until well blended. Add the flour and process until fully incorporated and it has made a ball. Pat into a circle and refrigerate while you make the filling. Finely chop the mushrooms in onion either in the food processor or by hand. Melt the 2 tablespoons of butter in a large skillet. Add the mushrooms and onion. Season with thyme, salt and pepper. Cook and stir until tender, about 5 minutes. Sprinkle the flour over everything so it won’t get lumpy, then reduce the heat to low and stir in the sour cream and cream cheese. Heat just until thickened then remove from heat. 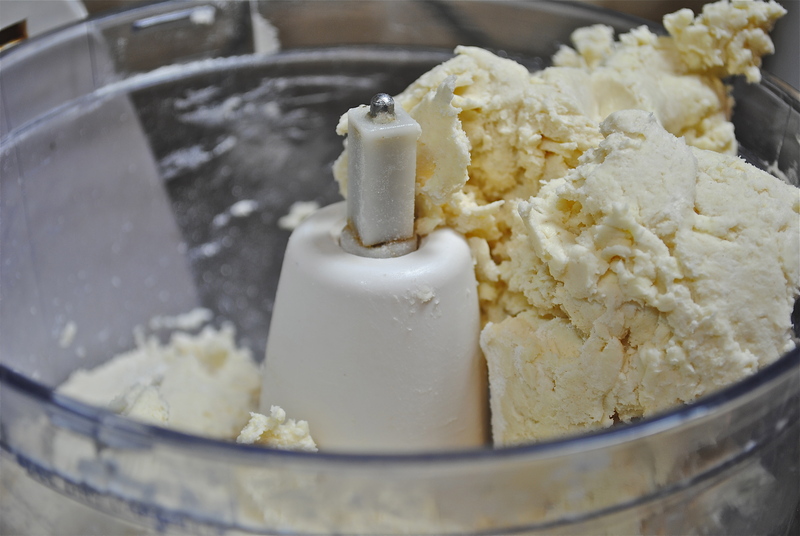 On a floured board, roll out 1″ ball size pieces of dough. 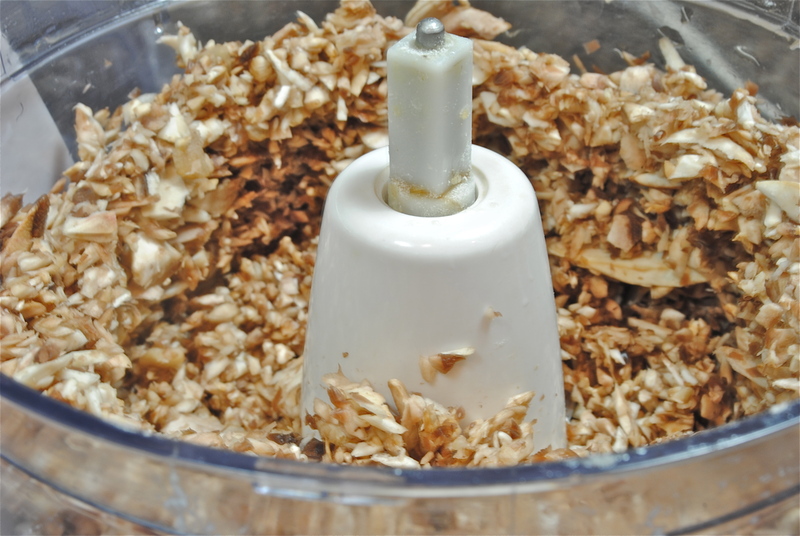 I use a dumpling press to make mine so if you don’t have one, just roll out to a small 3″ round. 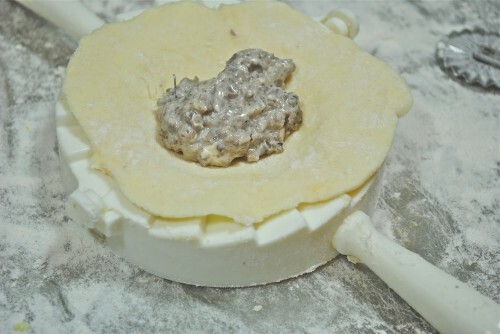 Place a small amount of the mushroom mixture on one side of each circle, then fold the dough over and press to seal using the tines of the fork or your dumpling mold. Brush tops with beaten egg and prick the top with the tip of knife to vest steam. Place on baking sheet. They can be frozen now for future use or baked immediately. Bake at 450° for 15 minutes or until golden brown. Drizzle with truffle oil, optional. If baking frozen turnovers, it may take an additional 5 minutes or so. Enjoy! 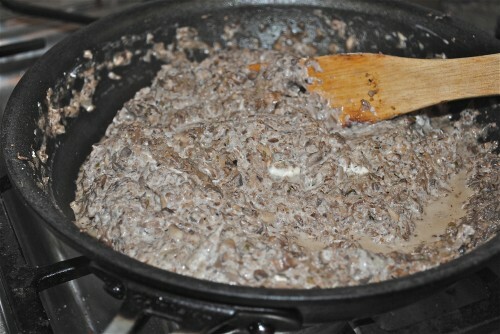 And try a mixture of mushrooms for a more intense mushroom taste. How many turnovers does this recipe make? I would say 3-4 dozen. Usually I have more filling and may pitch it or make another batch of pastry. Also depends on how big you make them. I use a 3″ dumpling press for mine.